It was a beautiful day in NYC yesterday, the perfect day to wander down the L.E.S. and meet a friend for lunch. So I did. My good friend Matt and I connected and headed over to Tiny's Giant Sandwich shop on the corner of Rivington and Norfolk. New ownership has spruced up the place to make it even more comfortable but not to worry. Tiny's Giant Sandwich Shop still delivers great, inexpensive food, especially the sandwiches. Great Sandwiches are Tiny's thing. Hot or cold, house specials or design your own, there is a sandwich to please everyone. Tiny's also offers a nice selection of salads. The addition of a high-powered espresso machine means good coffee is now an option as well as sodas (your standard fair as well a Boylans and G.U.S and their own house made sodas). Lemonade and Ice Tea round out the options. The space is comfortable and welcoming. Tiny's takes advantage of the corner spot with full windows on each side which makes the room sunny and bright as well as making it feel bigger than it is. As for my lunch. 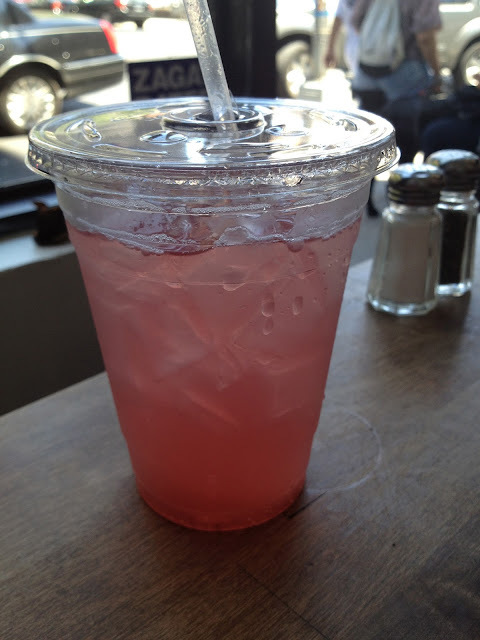 I tried the house made Raspberry-Rhubarb soda. It was nice and refreshing and leaned more sour than sweet. Turkey, bacon, melted cheddar, tomato, onion, spicy chipotle mayo on a toasted sesame semolina hero. Wow. Warm, crunchy, chewy, cheesy spicy goodness. This deserves a spot on any top sandwich list. The list of sandwiches is extensive. I will be back to try many more. There is a curried chicken sandwich special there right now with my name on it. goodness. that looks yummy (and decent pictures, as well). I cherish a fresh, a disintegrate, a dark colored betty. more than pie and WAY more than cake. I wonder how somewhat sweet marscapone would be on top...and if Middle Eastern stores have ever known about rhubarb.